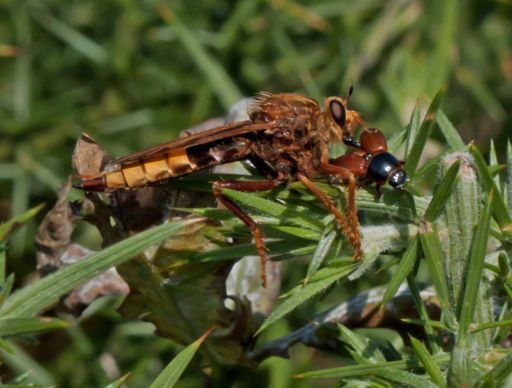 The Hornet Robberfly, photographed in September 2012 on the western edge of the New Forest approximately one mile from Latchmore Brook. This scarce species, which frequents dung (and its lavae live in dung), is on the lists of the Biodiversity Action Plan and the Species Action Plan because its numbers have dropped dramatically. The ponies and cattle which like to congregate on Latchmore Shade provide an environment which is attractive to this fly – please let us know if you see it down there.